I have an infinite and undying love for all (vegan) foods fried. Nothing makes me happier than firing up a vat of oil, smelling its aroma as it heats to a molten-lava temperature, then battering and plunging vegetables or tofu into it, watching them emerge golden brown, crispy and irresistible. 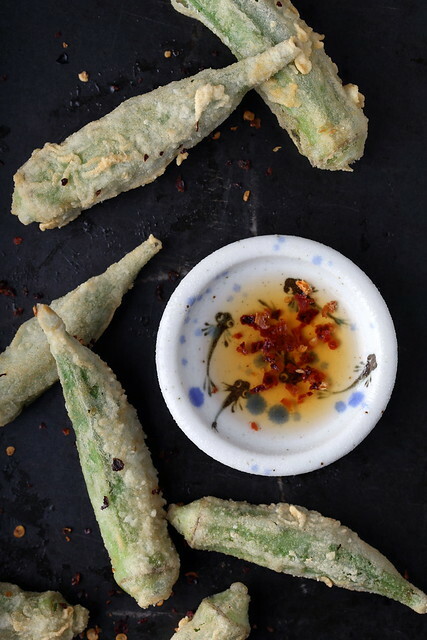 Deep-fried okra is and always will be a dish that evokes comfort and triggers small sensory memories for me, as I used to consume countless plates of it at diners and meat and threes throughout the southern part of the US many years ago. In case you are not familiar with this dish, the okra always comes sliced, heavily buttermilk-battered and served in ridiculously oversized portions. Although I no longer have easy access to this dish, and wouldn’t eat it even if I did, I still crave it and make my own version of it throughout the summer months. 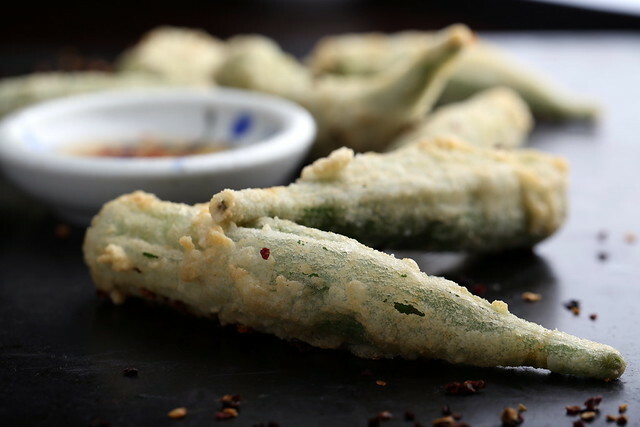 In my version, I like to keep the okra whole, and opt for coating it in a combination of dry cornstarch and potato flours, rather than dredging it through a thick batter. To counterbalance the richness, I like to serve it with a light vinegar sauce which clings beautifully to the coating without making it mushy. 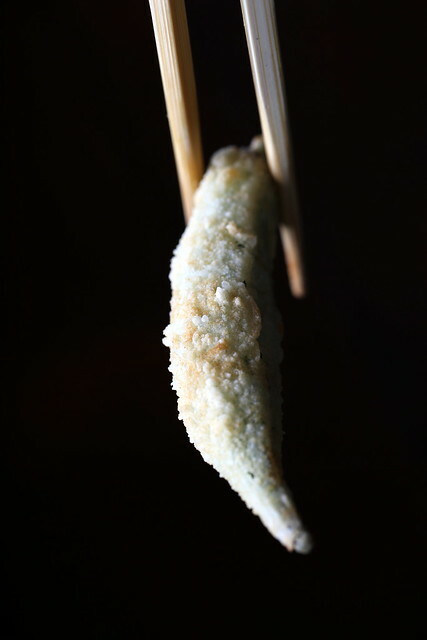 The okra remains slightly crisp, non-slimy and vibrantly green underneath this airy and tempura-like coating. Place the water and vinegar into a small saucepan. Bring to a small boil, then add in the sugar and salt and stir until dissolved. Remove from the heat, sprinkle with the red pepper flakes if desired, then place into the refrigerator to chill while you make the okra.Combine the almond or soy milk with the vinegar and baking powder in a medium-sized glass pyrex casserole dish or large prep bowl. Allow it to sit undisturbed for about 10 minutes. Wash it, pat dry, then add it to the milk and vinegar mixture. Allow to marinate for 30 minutes, tossing the okra around every 10 minutes or so to ensure all pieces are coated. While you are waiting for your oil to heat up, place the cornstarch and potato flour into a large shallow bowl, and stir to combine. In a separate bowl, whisk together the Ener-G and water. Remove about a quarter of the okra from the milk/vinegar mixture and place it into the Ener-G mixture. Toss to coat, then shake off any excess, then transfer it to the flour mixture. Dry your hands off, then toss the okra in the flour mixture to coat, tapping of any extra. Gently drop the okra pieces one by one into the oil. Allow to fry for a few minutes, until golden brown. Remove with chopsticks or tongs and place on paper towels, sprinkling immediately with salt. Repeat the process for the next three batches. Serve immediately with the chilled vinegar sauce. what an interesting take on fried okra! looks great! Wow, I have been waiting for this recipe for more than a few years. I have wanted to (tried to) love okra. Living and working in developing countries, okra often featured in meals consumed over the past years. I have tried different ways of preparing it. But, alas, no love. I think this recipe may be the way for okra to win my heart–it sounds so right, and I look forward to trying it. Thanks. I hope you enjoy, Gina! that first photo totally blew my mind. its looks like a cocoon hanging in the night. WOW! This sounds so good. I've never deep fried anything on my own….I might have to start. I love okra so much and I can't imagine not loving deep fried okra. i adore fried okra, and right now i'm in southern va where my love for it began. i used to dip it in ranch dressing, but the using the vinegar sauce looks interesting. I actually love dipping fried things into vegan mayo with sriracha or roasted garlic, but never thought about ranch dressing. Will have to whip up a vegan ranch for next time! hubbs is going to go ga ga over this. weekend frying plan has been made. It's funny, I've only had okra deep-fried, never un-battered/stir-fried! Maybe I should resist the urge to fry next time and try them sliced/unbattered/stir-fried for a new experience. So happy you enjoyed, Leila!